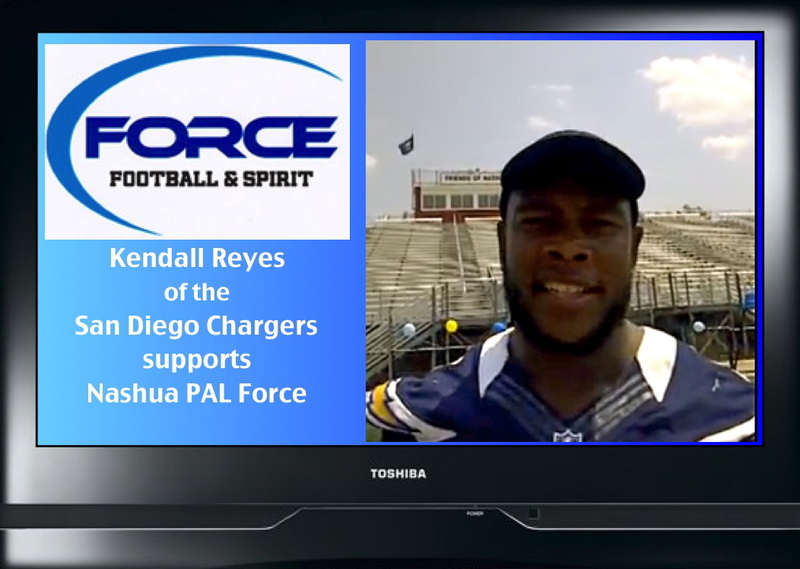 Kendall Reyes of the San Diego Chargers Supports Nashua PAL Force! Find out more about Kendall here. 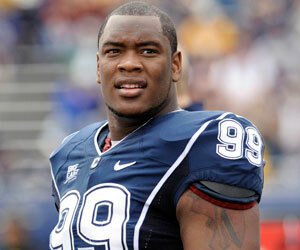 Kendall Reyes of the San Diego Chargers grew up in Nashua like you. He graduated from Nashua High School North. He donned the blue and white Nashua North Titans uniform and played at Stellos Stadium under Coach Jason Robie. He played against Nashua High South at the annual Turkey Bowl. At the 2012 Nashua PAL Force awards banquet Coach Robie spoke to the Nashua PAL Force football players and cheerleaders about Kendall. He told us that Kendall was someone who “owned each part of his day.” He described him as someone who followed through in everything he did, whether it be putting his cereal bowl in the dishwasher in the morning, showing up for practice on time, or being there for his teammates on the field. Sportsmanship wasn’t something he just showed on the field, it was something he lived every day of his life. He worked hard in school, he was a good friend, he was respectful to his teachers and coaches. Coach Robie let us know that it was the qualities Kendall posessed off the field that made him so valuable on the field and he encouraged us to follow suit. 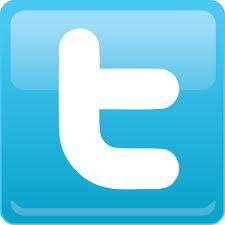 Kendall was afforded all the same opportunites that are being afforded to you right now. He grew up in the same town that you did, he played the same sport you can, he went to the same high school you will. There is nothing stopping you from following the same path Kendall took to reach success. 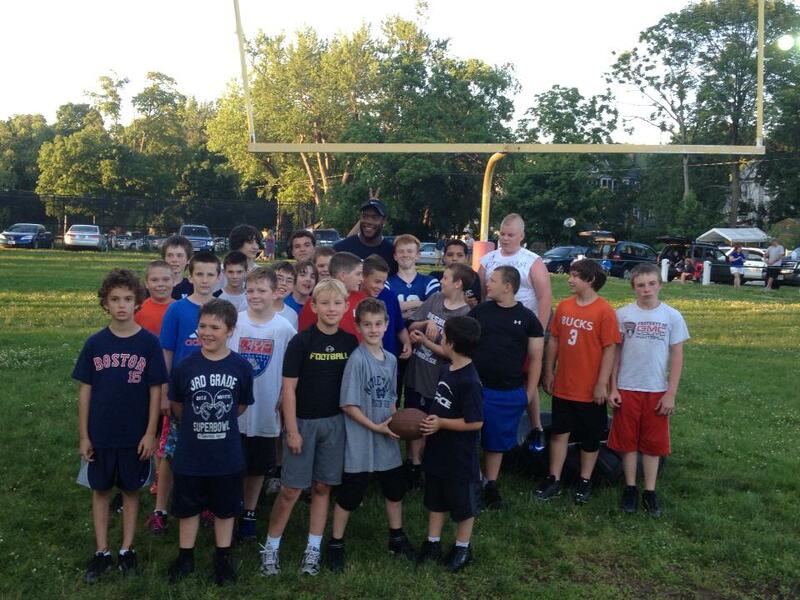 Kendall Reyes continues to prove that he is someone Nashua is proud to call their own both on and off the field. In his desire to give back to the community he grew up in, he created the R.E.Y.E.S. 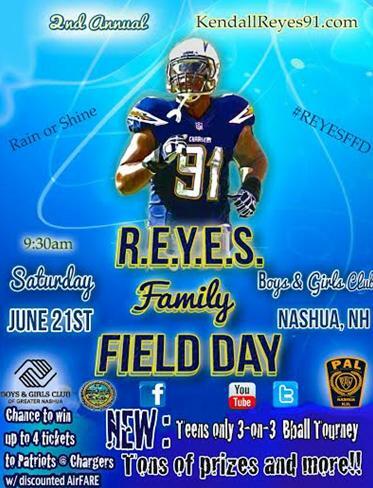 Family Field Day to benefit the Boys & Girls Club and Nashua PAL. Its first ever event this past Sunday, June 23rd at Stellos Stadium was a huge success for all of those who participated. The success of the R.E.Y.E.S. Family Field Day lies in the foundation behind its creation which is simply the desire to give back and to focus on the youth of Nashua. Nashua PAL Force is extremely proud of Kendall Reyes’ obvious professional success but also of the man he has become off the field as well. The youth of Nashua can look to him as someone to truly model their behavior after. Get off the couch and on the field, own each part of your day, be true to your word, and give whatever gifts are given to you to someone else so that they may also walk your path. The opportunity is there for the taking. Please continue to support Kendall as he supports YOU! If you live in the North district, or you live in a town that does not offer AYF football, then Nashua PAL Force is for you. We have energetic coaches who love the program, love the sport, love the community and love the kids. Look who showed up to our training camp! 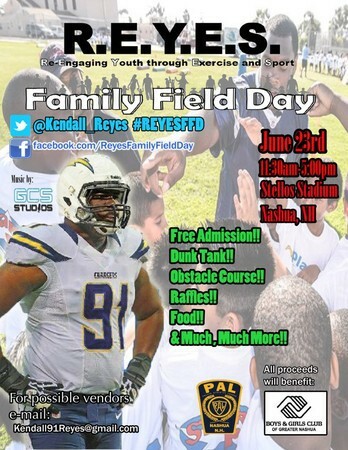 The REYES Family Field Day was a huge success on Sunday June 23rd, 2013 at Stellos Stadium in Nashua. Kendall Reyes was on hand to work with and greet his fans and fellow athletes in an event inspired by Kendall to raise money to support two youth organizations in Nashua. The Boys & Girls Club of Nashua as well as Nashua PAL. We look forward to the continued success of this program.